Written by Fiona Lawless on February 23, 2018 in Blog, Lodging, U.S.A.
Birthdays come but once a year, which can be a good thing on so many different levels! Setting aside our daily budget of $15 each, we instead sprang for two nights of luxury and comfort to celebrate my birthday back in October. 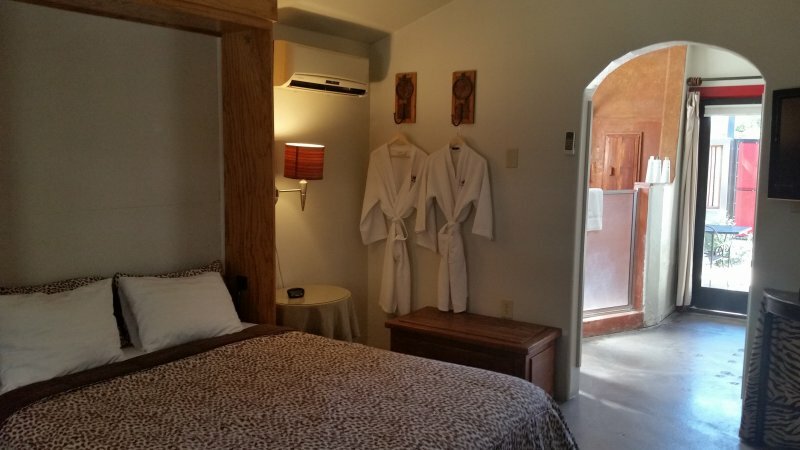 We opted to include a stay at Blackstone Hotsprings Lodging & Baths to our circuit of 9 hot springs in New Mexico; we couldn’t have made a better choice. Forgive my corniness but “in truth the only consequence” to whisking yourself off for a little getaway here is unadulterated relaxation. The town name was Hot Springs until 1950, when a radio show changed this appellation to Truth or Consequences. The radio show, called “Truth or Consequences,” proposed a promotional stunt – inviting a town to officially change it’s name to Truth or Consequences to celebrate the show’s 10 year anniversary. To this day there is an annual fiesta in town to celebrate the fateful day when Hot Springs, New Mexico officially changed it’s name. Blackstone Hotsprings is just one of 11 purpose built bath houses within the town of Truth or Consequences, New Mexico. Each bath house in town offers guests their own individual bathing/soaking experience. Blackstone Hotsprings provides a serene setting to soak your cares away with just a few added luxuries to complete the visit. Yes I know “luxuries” is code for, “so it’s on the pricier end”; true indeed (for those of us with tight purse strings), but when you flop out of there like a boneless chicken you’ll thank me! This historical bathhouse, originally dating to the 1930’s, was given a new lease on life in 2005 when Rob and Ralph became the new owners. They have invested more than money into the property. Their vision has included creating a unique retreat, with each themed room paying homage to specific television shows of yesteryear. Kitsch as this may sound, it is all done in an elegant and stylish way, with attention to detail right down to the minutiae. It continues to this day with two new suites currently under construction at the time of our visit. Even though we had set our budget aside, we were still mindful of the purse strings. We paid $97.33 (inc. tax) per night for The Studio. It was worth every penny! Essentially for this price we got a complete apartment, with the ability to self-cater. The cooker does not work, as pointed out on the official website. Besides, cooking is probably the last thing most people want to do when they come here! 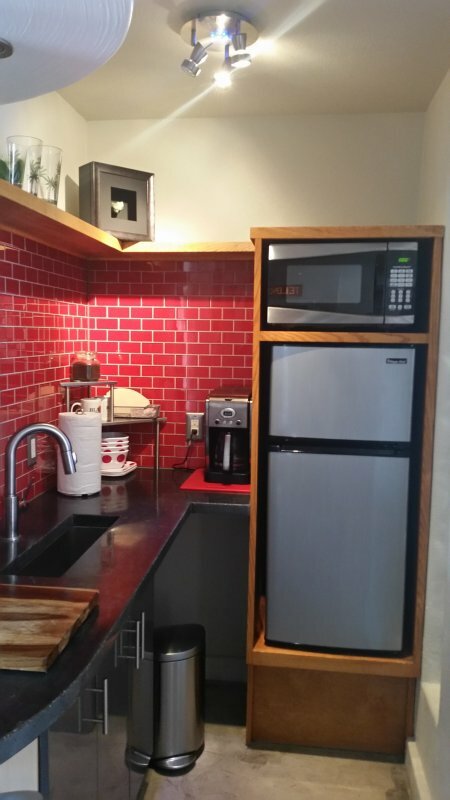 There is a microwave and a fridge, so you can bring some snacks and drinks to avoid dining out. In the morning you can use the coffee maker and complimentary dark roast coffee to get your day going. Within this self-contained unit is the most comfortable bed either of us has ever slept on. The Murphy bed enfolds it’s subjects in the softest, snuggest, downy (down alternative) comfort ever experienced. Naturally, the highlight of our stay was the in-room 1930’s historic tub. At a depth of about 18″ and with a never ending supply of soothing, hot mineral-rich water and complimentary toiletries, what wasn’t there to love? Add to that our current lifestyle, peppered with truck stop showers, and we suddenly found ourselves in bathing bliss. The Studio is the only room at Blackstone Hotsprings that can accommodate those travelling with a dog. If you are travelling with your furry friend please read their official pet policy before making any assumptions and reservations. Robin kindly gave us a tour of the unoccupied rooms. Our photos definitely do no justice to the level of comfort and detail amassed in each suite. Each room provides it’s own twist on the television show it is honouring. As well as the typical amenities common to each room – coffeemaker, microwave, television, bathrobes – the themed rooms offer that extra attention to the minutest details. 2 new suites have been added since the original publishing date of this post. To find out more about the Star Trek suite and the Wonder Woman suite go to Blackstone Hotsprings Lodgings & Baths. Hands down this was our favourite room that we got to take a peek in. This suite could even make Lex Luthor unwind; replete with a king sized bed, it also houses a separate bathroom and shower, as well as an extra large hotspring fueled tub. A super-soak for any superhero! The Kitchenette of the Superman Suite. As a tribute to the iconic Lucille Ball and Desi Arnaz, this “I Love Lucy” retro 1950’s room is the epitome of luxury. Unlike the “I Love Lucy” show, there are no separate single beds here. Instead you can retire to a luxurious king size bed. 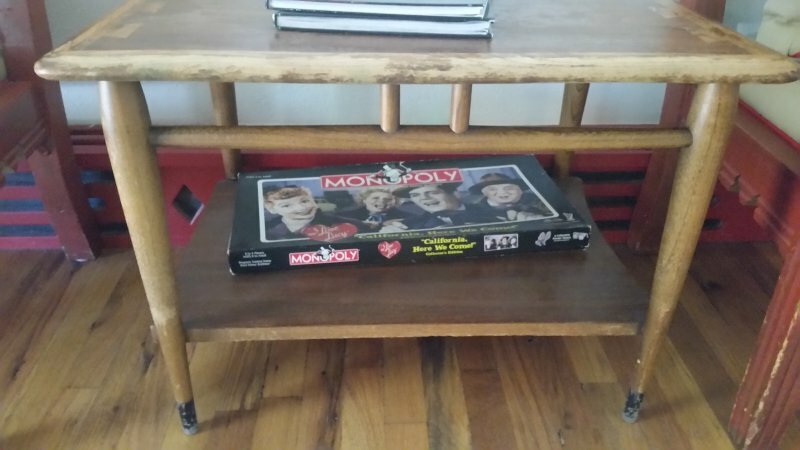 After a soak in the standard hotspring fed tub, you can curl up with the Lucille Ball autobiography or test how much you really do Love Lucy with a vintage game of Lucy-vintage Monopoly. Even Rod Serling could allow himself to cross into the dimension of comfort offered at Blackstone Hotsprings. “Submitted for your approval” is the Twilight Zone suite. It comes with a queen size bed, miniature kitchenette and semi-private patio, with the highlight of the show being the hotspring waterfall shower. This room is also ADA (Americans with Disabilities Act) friendly. Why not pamper yourself like a diva and indulge in the largest in-room hotspring tub offered at Blackstone Hotsprings? This tub could even soothe the formidable character Lisa Grimaldi, from this suite’s namesake soap-opera. Surely Eileen Fulton, the grand dame of daytime television, deserves a hotspring soak of this nature after 50 years of playing Lisa Grimaldi. This getaway includes a king size bed, a miniature kitchenette, a semi-private patio and your own in-room globe so you can watch – as the world turns. Watch As the World Turns, while you spin the Globe! The Jetsons – the largest of the suites, with an extra-large hotspring tub, king size bed, semi-private patio, kitchenette and Jetsons derived decor. The Golden Girls – a large suite with a king size bed, oversized hotspring tub, semi-private patio, kitchenette and 1980’s decor galore. Roy Rogers – the King of the Cowboys suite is indeed a king suite with a king size bed, standard size hotspring tub and kitchenette. The Lone Ranger – see below for pertinent information. This is a one bedroom apartment with a kitchenette (no cooker) and queen size bed. The three quarter bathroom is not supplied with water from the hot springs. Guest Bungalow – see below for pertinent information. This is also a one bedroom apartment with a kitchenette (no cooker) and a queen size bed. The full bathroom is not supplied with water from the hot springs. The Guest Bungalow is very comfortable, but plain in comparison to the other themed rooms and even the Studio. The Lone Ranger Suite and the Guest Bungalow are housed separately, directly across the street from Blackstone Hotsprings. It is important to note that both of these accommodations do not feature in-room hotspring baths. Fear not; as a guest of either of these accommodations you are provided with access to the two historic baths dating from the 1930’s located within the main establishment. If all of this in-room luxuriating isn’t enough to whet your appetite for a self-indulgent getaway, there’s more! There are 3 outdoor private baths available to both lodging guests and walk-in guests. Each colour coded bath – red, yellow or turquoise offers a unique private bathing experience. This comes at a separate cost for those who are currently lodging at Blackstone. Walk-ins are also welcome between the hours of 9:00 am to 9:00 pm. Each bath comes equipped with an overhead canopy, taking care of any glare from the sun. At sunset there is ambient mood lighting to enhance your bathing experience without detracting from the natural moon/starlight. Click here for current rates and more details. For an all-round private steamy sweat, soak and hydro-massage, treat yourself to The Wet Room. Like the outdoor baths, this comes at a separate cost for those who are currently lodging at Blackstone. Walk-ins are also welcome between the hours of 9:00 am to 9:00 pm. Reservations are essential for this private bathing experience. Within this tranquil, therapeutic sanctuary you will find a soaking pool of various depths complete with benches and ledges. From the pool you can drift to the geothermal steam room, where you can soothe your muscles with the powerful waterfall that magically cascades from above. This hydro-massage will pummel your neck, shoulders and back, albeit in a welcome, drenching kind of way melting away all aches and cares. For a truly invigorating Nordic sauna effect, I recommend alternating between a stint in the steam room and a blast of cold from the nearby shower. Just remember to drink plenty of water, before and during your soaks in any of the baths; dehydration can creep up on you. Blackstone provides complimentary water to guests of the Wet Room and there is a cooling lounge in a private room connected off the Wet Room. The natural mineral deposits built up around the soaking pool and in the geothermal steam room were fascinating. These deposits are removed every few weeks! Click here for current rates and more details about the Wet Room. Too relaxed? Need an excuse to recharge in a slightly more physically demanding way? Take yourself for a stroll. Winding throughout the town is the 3 mile loop known as The Healing Waters Trail. This pleasant walk will take you through the Historic Bathhouse neighbourhood and along the wetlands hugging the Rio Grande River, with beautiful views of Turtleback mountain. Can you spot the turtle? Perhaps another soak will be in order by the time you return to your lodging! The employees at Blackstone enhanced our stay. Naturally, working in the hospitality business they were friendly and welcoming, but they went beyond that. Robin assisted with this post by giving us a tour of the unoccupied rooms. She also picked us up a New Mexico map from the tourist information centre in town. Czesia kindly gave us a pass to the local Geronimo Springs Museum. Both Robin and Czesia were a wealth of information on other hotsprings within New Mexico also. Based upon our interaction with these two employees, we have to commend Blackstone and it’s employees on it’s customer service. Even your penny-pinching Drifters afforded themselves a reprieve at Blackstone Hotsprings! In our case the adage “a change is as good as a rest”, certainly rang true. Not only did we change up our itinerant lifestyle for a couple of days, but we did it in the most restful way. What a amazing place to treat yourselves. The photos were great and the decor does take you back in years. I absolutely love the Superman Suite, As The World Turns Suite and Babaloo Suite to mention a few. Very retro and totally awesome place to celebrate your birthday Fiona. I truly enjoyed this post and look forward to more to follow ? Love you two drifters be safe and enjoy your amazing adventures. Blackstone Hotsprings Spa is a special place, indeed. The staff were amazing as well; I could not have written this post without their help. Each room was better than the next! If you are ever in the area, treat yourself to this place. You certainly deserve it! It is always nice to see a post from you. You make me envious. We go from the 20’s to single digits, to 67 degrees, back to the 30’s, then 5 inches of snow in 3 hours in the same week in NW Pennsylvania. Currently we are outside Salt Lake City housesitting a Lakeland Terrier! We have been here almost 3 weeks and the weather here has been just as crazy. We went from unseasonably warm and snow free to cold and snowy. Our plan is to return to the Baja after Easter; we need to get more use out of that orange kayak! Happy belated birthday! The Blackstone Hotsprings looks amazing. Love the blog and the photos. Thanks so much for the birthday wishes! We both know you would love a soak at Blackstone. It is so good to hear you are enjoying the blog and the photos. That looks like a wonderful place to relax!!! I’ll have to keep that on the radar for possible trips. Glad you had a special birthday experience ? If you and Jeff find yourselves heading through New Mexico, I would definitely recommend this place! Again, we thank you for crossing paths with us in 2013. We will never forget yourself and Jeff and the kindness you showed us.